Quality. Innovation. Convenience. Designer Face Frames make it easy to have classy, designer-inspired looks that set your cabinetry apart from the rest. 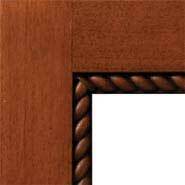 The Rope Inset Molding Face Frame (FE-2 Rope) gives a distinct look and pairs well with our rope molding cabinet doors and insert moldings.